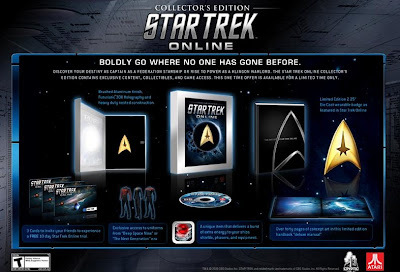 GameStop has the Star Trek Online Collector's Edition for pre-order (to be released 2/2/2010) and lists the details. This edition comes with a "Deluxe Packaging: Futuristic 3dX holography set in a high quality brushed aluminum finish. Heavy duty construction with magnetic closures and nested compartments for all components." There's also a "Deluxe Manual: High end, hardbound, art book, manual, and disc case in a single, elegant package. “HD Printing” on over 40 glossy pages of exclusive art from the Star Trek Online Universe." # Communicator Badge: High quality cast metal design based on the in-game badge model. Fully 3d Sculpted with recessed burst and curved contours. # Guest Passes: Credit card style buddy passes to invite three of your friends for a ten day trial of Star Trek Online. # Red Matter Capacitor: A unique item that charges up and delivers extra energy to all of your ship’s equipment for a short time. A device that, when used, gives you a small bump in energy, has a long recharge. # Next Generation Uniform: Uniform Options from and the Next Generation. The timeless look worn by Picard, Data and Riker. # “Deep Space Nine” Uniform: Uniform Options from the “Deep Space Nine” Series. Grey shoulders, on a black uniform, just like Sisko, Worf and Dax.